The Band of the Hour Association is pleased to welcome our 2018 Hall of Fame inductees, who were inducted at the Hall of Fame Ceremony Friday Nov. 2, 2018 at 5:30 PM in Fillmore Hall during Alumni /Homecoming weekend. 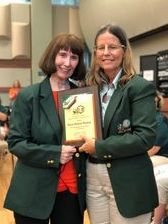 Hall of Fame sport coat and plaque were presented by Association Hall of Fame Chair (and Hall of Fame 2009) Bonnie Baldatti. 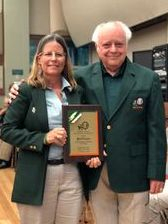 The Band of the Hour Association Hall of Fame was created to honor outstanding contribution to the University of Miami Band of the Hour. The inaugural Class of 1994 jump started a great tradition at the University of Miami. Members of the Hall include Miami Fight song composer's, a U.S Congressman, a current Trustee of the University, and former band members. This distinct group of people stand for the tradition and history of the Band of the Hour. Nominations are submitted annually and voted on by members of the Band of the Hour Association. The University of Miami Band of the Hour Association of Alumni and Friends established a Hall of Fame to identify and honor, in a permanent manner, those individuals who have achieved excellence in performance and/or musicianship, in the Band of the Hour or who have contributed to the advancement of the Band by support in time, resources or talent. Achieved excellence in the Band of the Hour, at the University, for a period of at least two academic years and have been officially disassociated as a student for a period of at least ten years. Advanced and enhanced the concept of the Band at the University, through their talent as directors. Contributed to the advancement of the Band of the Hour and are not classified as students or music directors and who may or may not have matriculated at the University of Miami.